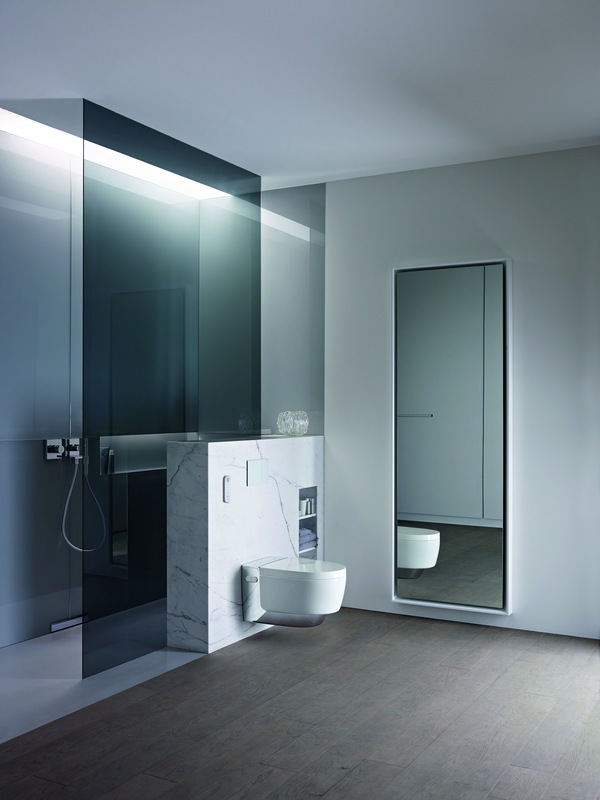 The new Geberit AquaClean Mera stands out for the high quality of the materials used and the refined aesthetics of its soft, continuous lines, typical of the style of rimfree bath fixtures. The chromium-plated surfaces covering the product convey the impression of floating, accentuated by the play of reflections. 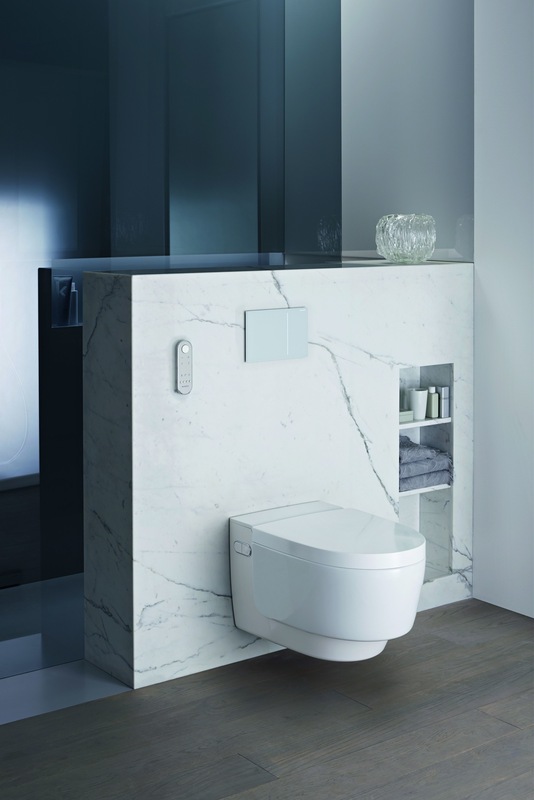 Geberit AquaClean Mera might look like a simple toilet, but it actually conceals sophisticated technology and power, with plumbing connections incorporated in the ceramics. A discreet orientation light activated by a proximity sensor immediately catches the eye, guiding users in the darkness. The cover opens automatically upon approach, eliminating the need to raise it by hand. Activated by the same proximity sensor, the ergonomic seat begins to warm up when the user approaches. The silent odor-removal technology, also automatic, relies on a long-lasting ceramic honeycomb filter to eliminate unpleasant odors exactly where they take form, in the ceramic bowl. Another particular advantage lies in the fact that when these functions are not active, they consume practically nothing. 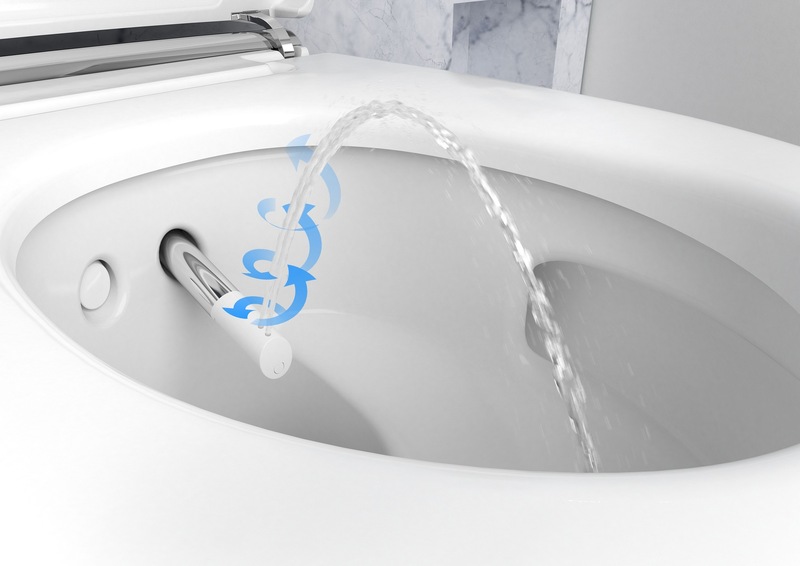 Where the personal hygiene function central to any toilet-bidet is concerned, the new Geberit AquaClean Mera features an innovative invention. The WhirlSpray technology patented by Geberit uses two nozzles to offer extremely precise and exceptionally pleasant cleansing, thanks to a pulsating stream enhanced by dynamic aeration. The delicate spray for femmine hygiene is separate, and remains hygienically protected until use, offering particularly enjoyable cleansing. With the new Geberit AquaClean Mera there is no longer any danger of feeling cold at the first contact with the water on the skin: the hot water system is replenished by a continuous-flow heating device, combined with a heater that maintains a reservoir of warm water. This guarantees a reserve of immediately available body-temperature water while preventing the temperature of the water from diminishing too quickly. The drying function is an innovative invention. The drying arm opens independently from the spray arm and automatically aligns itself with the position of the water spray to ensure optimal performance. The air flow temperature is gradually reduced, taking the changing heat sensitivity of the skin as it dries into account. Another strong point is the rimfree ceramic basin, with its striking asymmetrical inner geometry, which forms the basis for the innovative TurboFlush technology that guarantees exceptionally accurate but quiet flushing, though there is only one lateral outlet. The hard-to-reach zones have almost totally vanished in this ceramic bowl, and there are no corners or edges to prevent total hygiene. Finally, it is possible to insert all the instructions in the remote control in an intuitive way, with just one hand, while the display on the back simplifies the choice of one of the four settable user profiles. Geberit AquaClean Mera has won two prestigious awards – the Design Plus powered by ISH 2015 and the Red Dot Design Award 2015 –paying tribute to the product for its refined design and sophisticated technology. 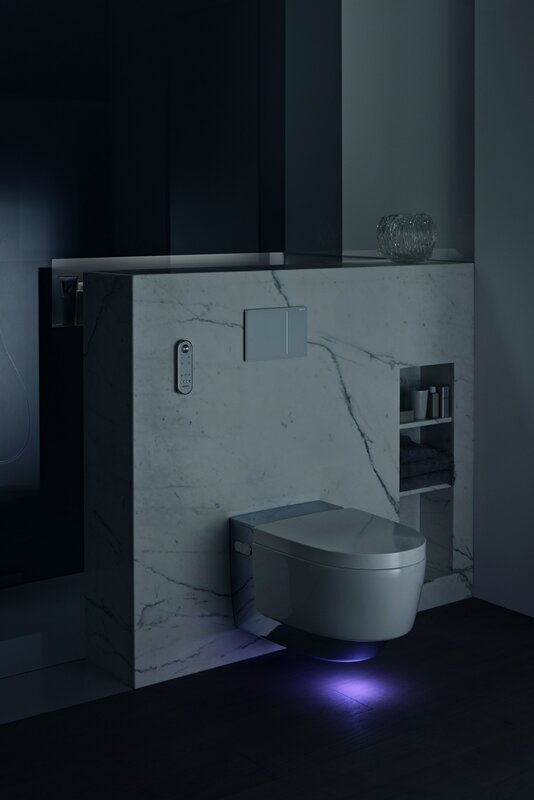 The new Geberit AquaClean Mera toilet-bidet in the version with chrome finish. A proximity sensor activates the discreet orientation light, which can be set in seven different colors as desired. The outer cover, in white: the new Geberit AquaClean Mera is available with the cover element in white or chrome. 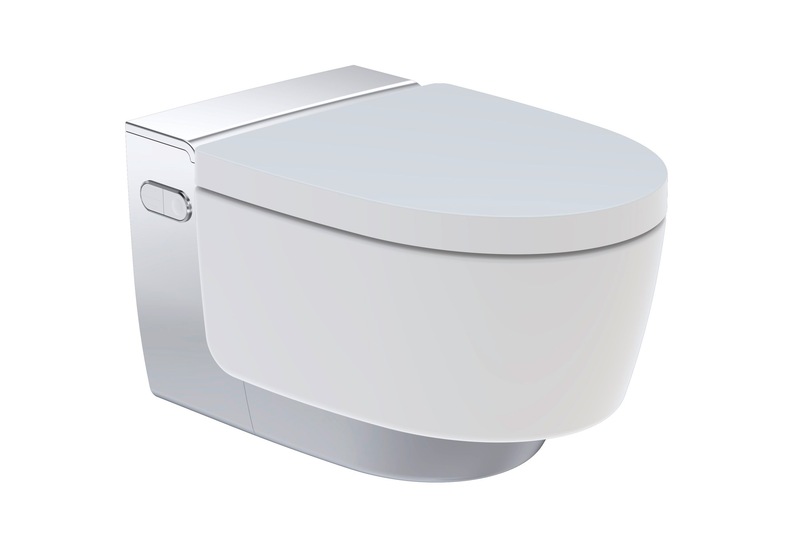 The new Geberit AquaClean Mera toilet-bidet in the version with white finish. The patented WhirlSpray technology guarantees a delicate, revitalizing spray. 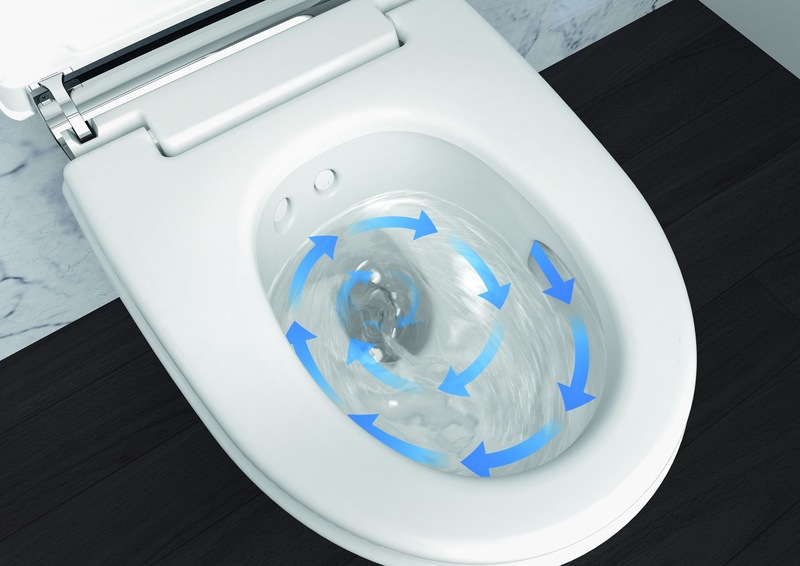 TurboFlush technology: the asymmetrical inner design of the rimfree ceramic bowl guarantees exceptionally efficient but quiet flushing. The new Geberit AquaClean Mera toilet-bidet becomes a forceful but harmonious presence in any bath environment.